Killer Jeans. A campaign by Labour Behind the Label and the Clean Clothes Campaign. The sandblasting saga continues as a completely unnecessary denim distressing technique persists. This despite the fact that around 40 brands banned the use of sandblasting in their supply chains as part of the successful campaign spearheaded by the Clean Clothes Campaign and Labour Behind the Label. What’s the big deal with sandblasting? I highly encourage you to read this short journal article to grasp the seriousness and the severity of this disease particularly when it comes to textile production. Last night, Students and Scholars Against Corporate Misbehaviour (SACOM), the Clean Clothes Campaign (CCC), War on Want and the IHLO (ITUC/GUF Hong Kong Liaison Office) released an incriminating report entitled Breathless for Blue Jeans: Health Hazards in China’s Denim Factories, which uncovers the continued use of sandblasting in China’s denim manufacturing industry. The investigation by SACOM was limited to six denim factories in Guangdong province (just across the border from Hong Kong) which some may think is not a representative sample. However, it is important to keep in mind that China’s textile manufacturing industry is concentrated in two areas, one of which is the Pearl River Delta which primarily covers Guangdong province, a hub for denim – around 50% of global production (CCC et.al. 2013. p. 10). Xintang county alone is responsible for “over 260 million pairs of jeans a year, equivalent to 60% of China’s total jeans production, and 40% of the jeans sold in the US each year (Greenpeace 2010).” The factories investigated include two major garment producers with thousands of workers; one of which supplies around 4% of denim sold in the US (CCC et.al. 2013, p. 10). The other 4 factories include a smaller production facility and three subcontractors. In interviews, SACOM found that workers were ordered to dismantle and hide sandblasting equipment in advance of factory inspections and audits, which was then reassembled once auditors exit the premises (p. 13). Furthermore, at one factory, younger workers began to reject sandblasting positions. The management responded by offering a higher wage for the position (p. 12). Therefore, although some workers are aware of the health risks associated with sandblasting they still take the job to secure a higher salary (p. 13). SACOM also outlines the emergence of new techniques designed to replicate the effects of sandblasting such as chemical spraying, bleaching and manual polishing and sanding. These techniques are themselves risky especially when performed without adequate safety equipment (pp. 14-18). SACOM’s findings highlight the importance of unannounced audits with off-site worker interviews in rooting out evasive activities in the supply chain. The report also reminds us that it is essential to remain vigilant when it comes to occupational health and safety especially when new techniques are adopted. Finally, there is a real need to instill a culture of safety beyond the first tier of production and into the lower tiers of the supply chain. This is a major problem in production. For example, look at the photo on page 17 of the report. See the worker smoking his cigarette while spraying the jeans with potassium permanganate? Often times, even when workers are trained to use safety equipment, they still ignore these requirements because the equipment either hampers their production speed, or gets in the way, or is uncomfortable, or they’re not used to it etc… Training is not enough. There has to be a concerted effort by all stakeholders involved to change the way people think about workplace safety and the costs associated with it. It is truly sad that evasion and the expectation that it will happen is an industry norm, leading to supply chain relationships built on suspicion and policing. It’s time for systemic change that aims to transform norms and values related to workplace safety. The view that workers are dispensable production inputs is antiquated, to say the least. Akgun, M., Mirici, A., Ucar, E. Y., Kantarci, M., Araz, O., & Gorguner, M. (2006). Silicosis in Turkish denim sandblasters. Occupational Medicine, 56(8), 554-558. Clean Clothes Campaign, SACOM, IHLO, & War on Want. (2013). Breathless for Blue Jeans: Health hazards in China’s denim factories. Greenpeace. (2010). The Dirty Secret Behind Jeans and Bras. This entry was posted in Health and Safety, Labour, REPORTS, Responsibility, Social Conditions on July 9, 2013 by Nadira Lamrad. The University of British Columbia Law Review has recently published one of Nadira’s papers. Nadira presented “Transnational Business, CSR, and Governance in China” at the Corporate Social Responsibility in the Pacific Rim conference held in Vancouver on April 15, 2011 – a conference organized by The Asia Pacific Dispute Resolution Research Project, The Centre for Business Ethics Research Network (CBERN) and The National Centre for Business Law (NCBL). So if you’ve ever wondered what Nadira’s up to with her research at City University in Hong Kong, have a look and get in touch!! This entry was posted in A Closer Look, CSR, Education, EDUCATION, Labour, Social Responsibility, SOCIETY, Supply Chain on December 31, 2012 by Mary Hanlon. 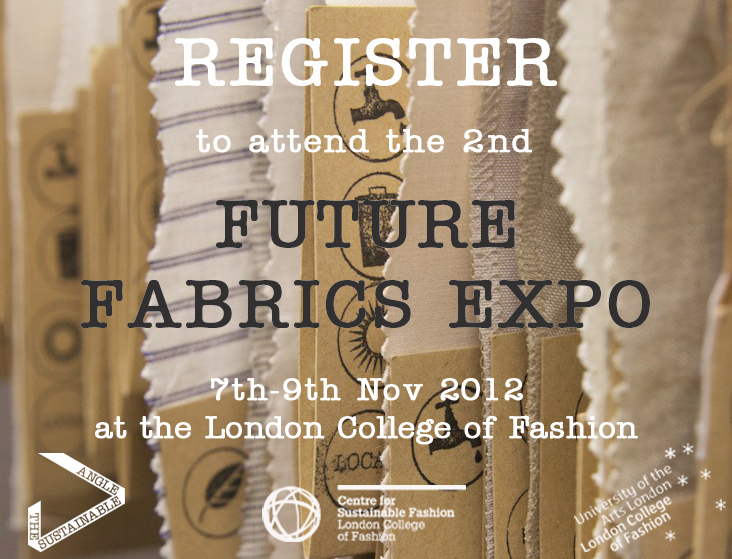 This November be sure to check out the Future Fashion Expo hosted by the London College of Fashion. 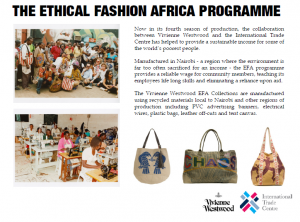 This event is organised by The Sustainable Angle with the support of the Center for Sustainable Fashion. Visitors to the Expo will have the opportunity to view a diverse range of fabrics and gain a feel for their aesthetics and performance, as well as finding out about their production. Last year, I attended the first Future Fabrics Expo and found it to be an informative research opportunity that I highly recommend to others. As a fashion student interested in responsible sourcing most of my research had previously been online and I was grateful for the chance to browse at the Expo; getting up close to so many new and exciting fabrics. Now in its second year the Future Fabrics Expo is expanding to include further information about other aspects of fashion supply chains as well as moving to the prestigious Rootstein Hopkins Space. I am excited by the broader scope of this year’s event which again promises to be an invaluable experience for designers and students alike. This entry was posted in ...AND EVERYTHING ELSE, DESIGN, Dyeing, ECOLOGY, Environment, Events, Exhibition, Fashion Design, Fibre/Material, Future Fabrics Expo, London College of Fashion, Responsibility, Socially Responsible Design, Sourcing, Supply Chain on August 29, 2012 by Maughan Pearce. A new report by the Clean Clothes Campaign exposes the continued use of sandblasting in the Bangladesh garment industry, despite it being banned by some big brands and outlawed in Turkey since 2009. 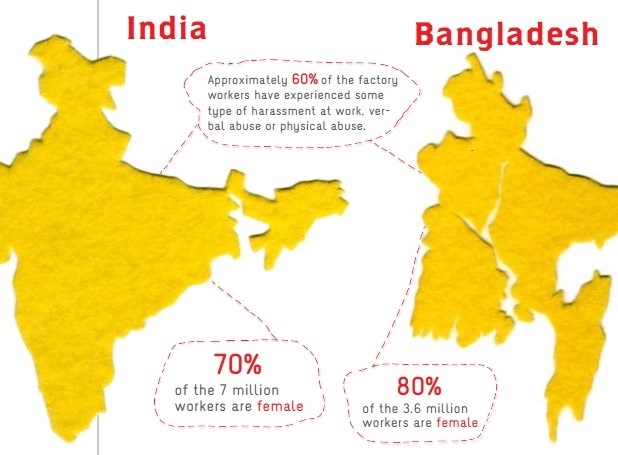 The CCC recognise that this problem is not exclusive to Bangladesh, and like the International Textiles Garment & Leather Workers’ Federation [ITGLWF], call for global action on the issue. Sandblasting is a technique used to distress denim and the practice is widely accepted as being dangerous to workers health, including exposing them to the risk of Silicosis, an incurable and potentially fatal lung disease. These concerns are made more worrying where health and safety precautions are inadequate or non existent. 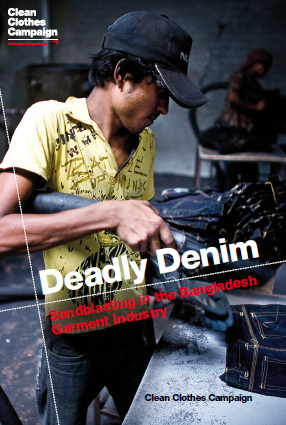 The Deadly Denim report contains the findings of research conducted in Bangladesh including interviews from garment workers, suppliers and heath care professionals; it also explores why sandblasting is still widely used despite the known dangers, and offers recommendations to brands, governments and international organisations. The issue of sandblasting is one which should lead us all to question the real cost of the clothes we buy and whether it is ever acceptable for people to risk their lives in the production of fashion items. This entry was posted in Bangladesh, DESIGN, Fashion Design, Health and Safety, Responsibility, Social, Socially Responsible Design, The Clean Clothes Campaign on April 6, 2012 by Maughan Pearce. As promised here is an update of the second NICE consumer consultation webinars, The Art of Sustainable Consumption. At this session we heard from four speakers presenting a range of responses to sustainability. In bringing them together we were able to imagine what ‘sustainable consumption’ might look like and also how some of these approaches could be linked. 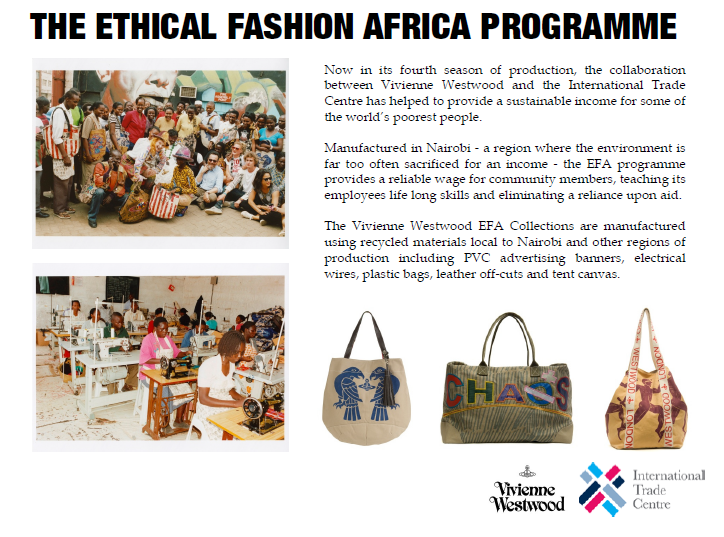 Giordano Capuano -Vivienne Westwood- presented the model of ethical production behind Westwood’s Ethical Africa collection. The project began as part of an initiative of the International Trade Centre, which aimed to link luxury brands in the West to producers in communities where poverty is high. The exciting thing about this project (and others like it), is the long term ambition which involves, empowerment through meaningful work and training, and sharing skills that will help to achieve sustained trade opportunities in global markets. Whilst this example demonstrates positive production and sourcing, it is not a solution to ethical production that could be replicated in all sectors of the fashion industry today. 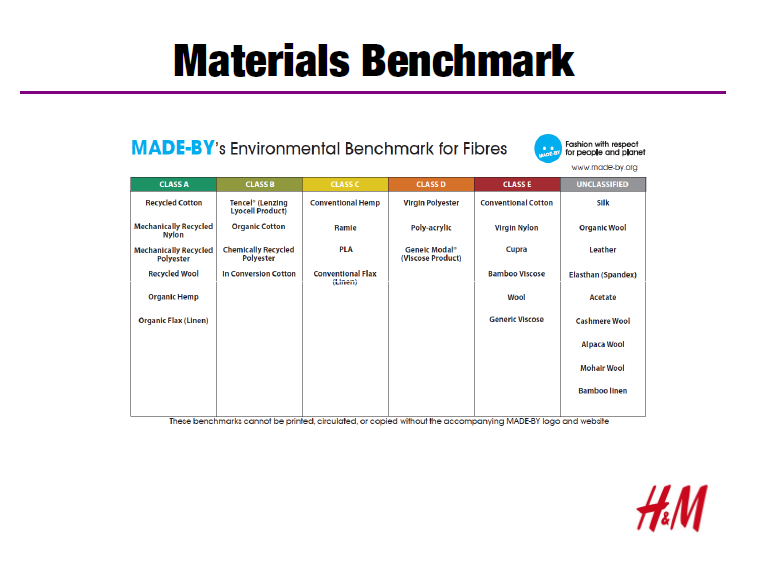 Next up Henrik Lampa (H&M) talked about how H&M is actively seeking to improve its supply chain through a more sustainable fabric sourcing policy, guided by research from Made By. Conventional cotton production has a negative effect on the environment and can also be damaging to people the land they rely on through the heavy use of pesticides and water; working towards ‘better’ cotton is a step in the right direction, and H&Ms efforts here will hopefully prompt other companies to follow suit! Of course we also know that fast fashion is problematic in relation to the volume of disposable goods produced, and the production speed that is necessary to be competitive. These factors can translate into difficulties for suppliers and negative conditions for production workers; however it is hard to see how improvements here can be made from within individual companies when this would compromise their competitiveness in their market sector. Perhaps tackling this problem requires a multi-brand approach that will give all companies a level playing field whilst improving conditions for garment workers? The next presentation by Mo Tomaney of Central Saint Martins, focused on design-led responses to sustainable consumption. Mo inspired us with these case studies from the design world, Junky styling, From Somewhere and Gary Harvey. Finally she introduced the student program Reclaim to Wear, which aims to prompt the next generation of designers’ to think sustainably. As a student designer myself this is of real interest to me, and I believe design could be involved at every level of sustainable consumption in diverse and exciting ways. Design can also act as a valuable conduit between seemingly conflicting needs, such as the desire for rapid change and the need to reduce waste. Aptly, the last speaker Ellen van den Adel, talked about post-consumer textile waste. Discussing how the consumer benefits emotionally from the knowledge that their waste will be reused, and how consumers understand the message about recycling and many do recycle or want to. 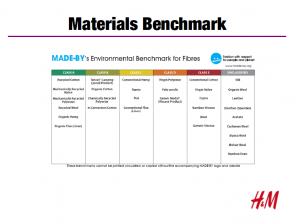 However the viability of the textile recycling industry is threatened by a number of factors which are likely to become more influential into the future. 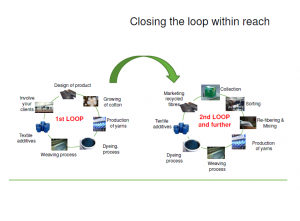 In response to this Work in Progress have collaborated with Textile 4 Textile to develop an automatic sorting machine capable of sorting textiles by colour and fibre type; this sort of technological advancement may help protect the used textile trade. Education and dialogue between companies, designers and textile recyclers could also help to improve the end of life opportunities for our clothing. The seminar inspired a level of optimism about what is already happening to improve the sustainability of the products we consume, at the same time an approach to disposable ‘fast fashion’ remains unclear. This is the most complex of topics as it is inseparable from broader themes such as our economic structure, competition, and many social and cultural factors (for example the speed at which information travels today is related to the rapidity of trend cycles), all of which go far beyond fashion itself. Listen to the entire webinar and view the presentations here. This entry was posted in Consumer Education, fashion, Fashion Design, Fast Fashion, Garment Disposal, recycle, Responsibility, Seminar, Socially Responsible Design, Supply Chain on March 27, 2012 by Maughan Pearce. The Fair Wear Foundation (FWF) has recently produced a short film which presents a clear summary of what they do, how they do it, and the reasons why. The organisation works towards fair labour conditions for garment workers. To define this they identify eight labour standards based upon the UN human rights principles. These objectives include maintaining a living wage, an end to child labour and the right for workers to form or join a union. The FWF supports brands in achieving these aims in an open manner and provides consumers with the information they need to shop ethically. The position of the FWF is one of rational and constructive action, working in collaboration with many stakeholders to implement and monitor clear strategies for improvement. Brands who sign up may find they have work to do, but by signing up they are showing a genuine commitment to change. This is in contrast to the reactionary cut and run approach that is sometimes taken in response to exposure for labour rights abuses which can be more damaging to the workforce and does not help to address the long term issues. When doing some customer research last year, I found that a lack of transparency in garment supply chains hampers efforts for change. I was told by many people that they didn’t have the information they needed to make ethical purchases. There was also a lot of confusion about what to believe, for example, when a brand’s ethical policy did not seem to reflect the reports in the news. The FWF provides consumers with a verification of labour conditions, however in the UK, there are still only a handful of brands signed up. This leads to another opinion repeatedly expressed to me: the lack of choice for ethical shoppers. If we as consumers want transparency and choice in the purchases we make, then maybe we should be the ones asking brands demonstrate their commitment to ethically produced fashion. One way may be to sign up for the FWF code. 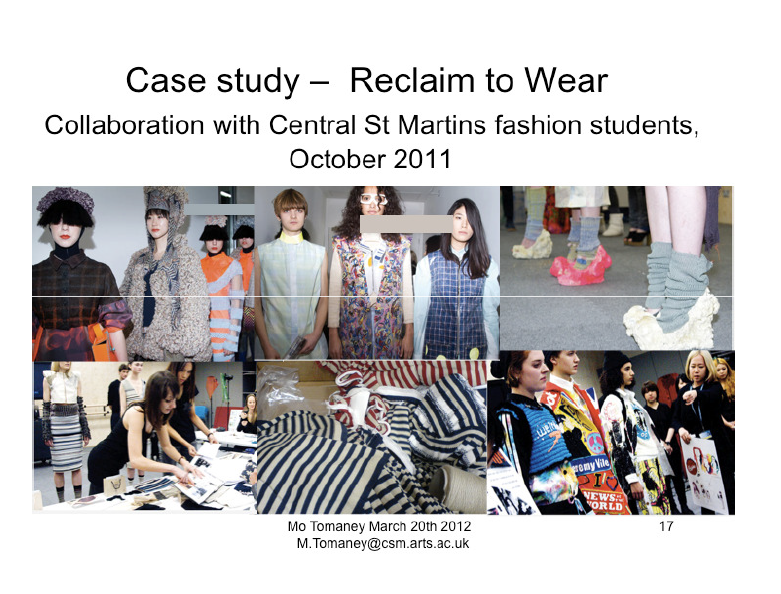 This entry was posted in Consumer Education, CSR, Education, fashion, Fashion Design, Fast Fashion, Labelling, Labour, Lifecycle Analysis, Product Design, Responsibility, Social Responsibility, Socially Responsible Design, Supply Chain, Transparency on March 1, 2012 by Maughan Pearce. 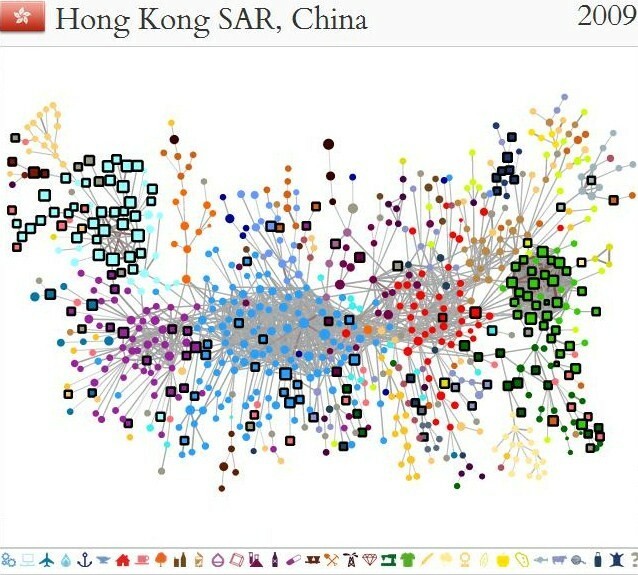 Licensed through the Creative Commons, The Atlas of Economic Complexity: Mapping Paths to Prosperity is a collaborative project that builds visualizations on import/export trade flow of products and goods. Once the visualization is built, learners can scroll their mouse over each category for further details. Click here to read up on the research methodology used. 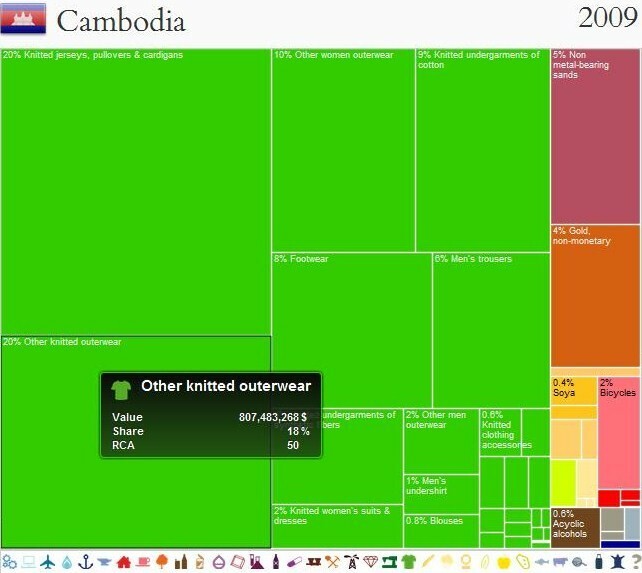 This entry was posted in Cambodia, Education, Responsibility, Student Education, Supply Chain, Tutor Education and tagged creative commons, economics, exports, Harvard, Hong Kong, imports, mapping, MIT on November 24, 2011 by Mary Hanlon. Anti-Slavery International has recently relaunched their Cotton Crimes campaign with a new video. Anti-Slavery International is calling on the European Parliament to remove preferential trade tariffs with Uzbekistan. Click here for more information and to sign the petition. Over 60 international retailers have joined forces to boycott Uzbek cotton, publicly stating their commitment to the eradication of forced child labour through the Responsible Sourcing Network, an As You Sow initiative. This entry was posted in Child Labour, Consumer Education, Cotton, CSR, Education, Fair Trade, Fibre/Material, Forced Labour, Health and Safety, HIDDEN NARRATIVES, Hours of Work, Human Rights, Labour, Political, Responsibility, Social, Social, Social Responsibility, Student Education, Supply Chain, Transparency, Tutor Education, Uzbekistan and tagged Anti-Slavery International, As You Sow, Cotton Crimes, Responsible Sourcing Network, Uzbekistan on November 23, 2011 by Mary Hanlon.